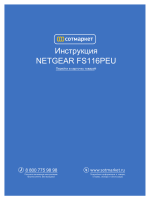 В© 2010 by NETGEAR, Inc. All rights reserved. NETGEAR, the NETGEAR logo, and Auto Uplink are trademarks or registered trademarks of NETGEAR, Inc.
make changes to the products described in this document without notice. and has been granted the right to test the series for compliance with the regulations. with intermediate computer and Internet skills. Note: This format is used to highlight information of importance or special interest. Tip: This format is used to highlight a procedure that will save time or resources. 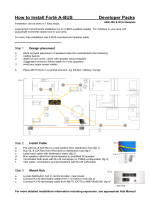 To print this manual, use the Complete PDF Manual link at the top left of any page. version of the complete manual opens in a browser window. Click the print icon in the upper left of the window. save paper and printer ink by selecting this feature. desktop or wall-mountable switch, the GS110TP Smart PoE Switch is not intended to be rackmountable. 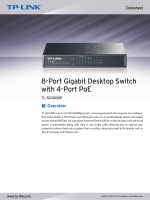 The GS110TP is a PoE-supportable, low-port switch with two fiber uplinks included. Control Center program, a utility that runs on a PC. Gigabit Ethernet devices. In addition, all RJ-45 ports operate in half-duplex or full-duplex mode. Eight RJ-45 10/100/1000 Mbps autosensing Gigabit Ethernet switching ports. Two 1000M SFP Gigabit Ethernet switching ports. Full NETGEAR Smart Switch functionality. Autosensing and auto-negotiating capabilities for all ports. Auto Uplinkв„ў on all ports to make the right connection. 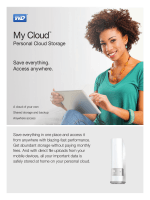 table contains up to 4K Media Access Control (MAC) addresses. Store-and-Forward transmission to remove bad packets from the network. Full-duplex IEEE 802.3x pause frame flow control. Active flow control to minimize packet loss and frame drops. Per port LEDs, power LED. Standard NETGEAR 1xx series chassis. Ports 1 through 8 support IEEE 802.3af, Alternative A (MDI-X). PoE is enabled by default. The power consumption automatically adjusts based on the RJ-45 cable length. Each port is configured to power down automatically when the port link is down. 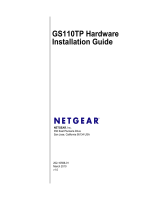 Figure 1-1 shows the package contents of the NETGEAR GS110TP Smart PoE Switch. If any item is missing or damaged, contact the place of purchase immediately. negotiating the duplex mode with the link partner automatically. Figure 2-2 illustrates the NETGEAR GS110TP Smart PoE Switch back panel. each RJ-45 port. Each SFP port has its own indication LED. вЂў Off = No link is established on the port. вЂў Solid Green = A valid 1000 Mbps link is established on the port. the port at 1000 Mbps. вЂў Solid Yellow = A valid 10/100 Mbps link is established on the port. the port at 10/100 Mbps. вЂў Off = No PoE powered device (PD) connected. вЂ“ Short circuit on PoE power circuit. вЂ“ PoE power demand exceeds power available. вЂ“ PoE current exceeds PD's classification. вЂ“ Out of proper voltage band (44 ~ 57 VDC). вЂў Solid Green = A valid link is established on the port. The following table describes the system LED designations. вЂў Solid Yellow = The switch is booting. вЂў Off = Power is disconnected. вЂў Off = There is at least 7W of PoE power available for another device. вЂў Solid Yellow = Less than 7W of PoE power is available. вЂў Flashing Yellow = The PoE MAX LED was active in the previous two minutes. cable terminated with an 8-pin RJ-45 plug. Senses whether the cable is a straight-through or crossover cable. port to a router, switch, or hub). uplink connections, while eliminating concern about whether to use crossover or straightthrough cables when attaching devices. The Smart Switch has a Reset button on the front panel to allow you to manually reboot the switch. again as the switch performs its Power On Self Test (POST). opening to press the recessed button for two seconds. 1000 Mbps hubs and switches. connected to the server or PC can provide 2000 Mbps throughput. вЂў Desktop installations - Provide a flat table or shelf surface. screws supplied with your switch. front panel LEDs, and access the power connector. accidentally turn off power to the outlet and the switch. warm air exhausts, hot-air vents, and heaters. sure there is adequate airflow in the room or wiring closet where the switch is installed. source of electromagnetic noise, such as a photocopy machine. The GS110TP Smart PoE Switch can be used on a flat surface or mounted on the wall. correspond to the slots on the bottom side of the GS110TP, then mount the switch. Verify that all cables are installed correctly. Check cable routing to make sure cables are not damaged or creating a safety hazard. Ensure all equipment is mounted properly and securely. device to 100 m (328 ft.). 2. Connect the AC power adapter cable into a power source such as a wall socket or power strip. When applying power, the Power LED on the switchвЂ™s front panel illuminates. power source is good. If this does not resolve the problem, refer to Appendix A .
results in the improvement of its overall performance as well as the performance of the network. device. The default IP address is 192.168.0.239 and subnet mask 255.255.255.0. The following table lists symptoms, causes, and solutions of possible problems. port at both the switch and the connecting device. Half-duplex or full-duplex Make sure the attached device is set to autoperformance degradation setting on the switch and negotiate. troubleshooting suggestions in this section. North America, please refer to the support information card included with your product. determines the speed correctly and the duplex mode defaults to half-duplex. that the attached device supports auto-negotiation. SNTP (Simple Network Time Protocol) 2 servers. Disabled by default.